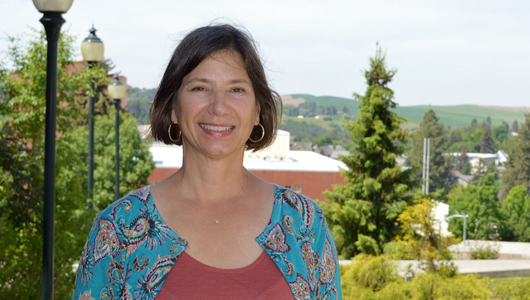 Associate Professor Pamela Thoma has been named director of the new Program in Women’s, Gender, and Sexuality Studies and will lead affiliated faculty in building an interdisciplinary, collaborative undergraduate curriculum. Thoma brings more than 20 years of higher education experience to the post. She is an expert in Asian American literary and cultural studies, feminist media studies, and women’s literature, and her research and teaching interests span feminist and queer theory, contemporary film and television, political economy, and the health humanities. “Dr. Thoma’s experience and commitment will be great assets as we look forward to new opportunities through the Program in Women’s, Gender, and Sexuality Studies,” said Larry Hufford, interim dean of the College of Arts and Sciences (CAS). Based on the recent academic realignment in CAS, the program will be housed in the Department of English, where additional interdisciplinary units thrive. It will build upon the current curriculum and work to more fully reflect the concerns and intellectual domain of associated coursework and scholarship along with advances in the field, both nationally and internationally. Before joining the WSU faculty in 2007, Thoma held faculty appointments at Takayama College in Japan, Colby College in Maine, and the University of Texas at Austin. At Colby, she was jointly appointed in American studies and women’s, gender, and sexuality studies, where she served as associate director and director. At WSU, Thoma coordinated the internship program in the former Department of Women’s Studies, received the Susan Armitage Women’s Studies Faculty Award for Teaching, and served as the graduate director of the Program in American Studies. She has been an elected CAS representative on the WSU Faculty Senate and also serves on the Research and Arts Committee. In 2015 Thoma was a visiting fellow at The Gender Institute at the London School of Economics and Political Science. In 2016 she received a Fulbright Scholar Award, which took her to Okinawa, Japan, for a semester at the University of the Ryukyus and Meio University. Her current book project explores popular preoccupations with fertility and social decline. Thoma is the author of Asian American Women’s Literature: Feminizing Genres and Neoliberal Belonging (2014), as well as numerous articles and book chapters, and is co-editor of the forthcoming volume Approaches to Teaching the Works of Karen Tei Yamashita. She earned her doctoral degree in English from the University of Colorado Boulder. Her immediate plans as director of the program include leading efforts to increase involvement and numbers of affiliate faculty; to update and streamline the curriculum; to create undergraduate and graduate certificates open to all students; and to deepen alumni engagement. The program already is involved in several student-centered initiatives, such as the humanities degree through WSU Global Campus, a proposed workplace diversity minor administered through the sociology department, and a series of scholarly events and symposia to be held on WSU’s various campuses. By Adrian Aumen, College of Arts and Sciences. This article was updated on Aug. 14, 2018, with the program’s new name. « Dr. Universe: How do cacti survive in hot, dry environments?